They're a group comprised mostly of local talent. Some college guys home for the summer. Some post grads looking to continue their soccer careers. 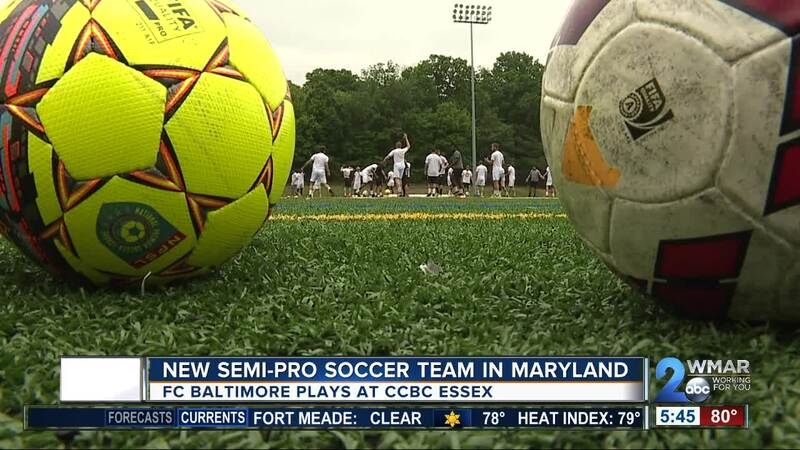 All with one goal: score many of them for the area's newest semi-pro soccer team, FC Baltimore. "It's a first year club but a club that's off to a good start in the league and a club that I think has a long future in the city," said Head Coach Brandon Quaranta. FC Baltimore plays in the Mid-Atlantic Conference of the National Premier Soccer League. They play their home games at the Community College of Baltimore County's Essex campus. The who's who of Baltimore area all-stars was assembled by Quaranta, who also coaches at McDonogh. "Baltimore is obviously renowned for its soccer and has been that way for a long time," he said. "I wanted to put together a roster that was reflective of that." "A lot of these guys I've known since I was 12 or 13," said FC Baltimore's Cale Thorne, who is also a Towson native. "I've been playing with them since then. Gone through a lot personally with them." "The culture we can bring here will be very good for this entire area," added FC Baltimore's Joshua Fawole, who is Columbia native. "I knew a lot of the boys from previous club soccer. So, for us to pick it up and put on for our city I think will be a very good thing." Contributing to building a winning culture is Baltimore Blast star Vini Dantas. He's an assistant coach along with Blast goalie William Vanzela. "It's really fun. The team is really good. Most of these kids are very driven. They want to try to push to be a pro. So, that sort of mentality is always fun to be around," he said. So far FCB has only played one league game, beating a Virginia Beach team that was undefeated last year 5-2. FC Baltimore's next game is Wednesday, on the road, against DC United's U-23 team. It's next home game is Saturday, at CCBC Essex, against Legacy '76 (Williamsburg, Va.).